Do you have an idea for an event we should host? Leave a comment or email and let us know! In April 2016 we celebrated the girl detective who has undergone radical changes over the years, but remains a model of girl power. In March 2016 we hosted our third Tolkien Reading Event. Twitter Chat at 8:00 pm EST. Should You Host Giveaways to Promote Traffic? During Summer 2015, we posted a interactive Hogwarts adventure. Start by visiting Diagon Alley for school supplies and continue through to graduation and your first job! In April 2015, we hosted posts celebrating the works of the early modern poet and playwright William Shakespeare. Discussion Post: Shakespeare for Children and Teens? In January 2015, we hosted a week of posts celebrating the works of the nineteenth century author Charlotte Brontë. Personality Quiz: What Charlotte Brontë Heroine Are You? In March 2014, we hosted our second Tolkien Reading Celebration in honor of Tolkien Reading Day (3/25). From January to March 2014, Pages Unbound and Stephanie of Chasm of Hosts co-hosted a read-along of The Lord of the Rings by J.R.R. Tolkien.h. January: Stephanie led discussion on The Fellowship of the Ring at her blog, Chasm of Books. February: Krysta led discussion on The Two Towers here at Pages Unbound. March: Briana led discussion on The Return of the King here at Pages Unbound. 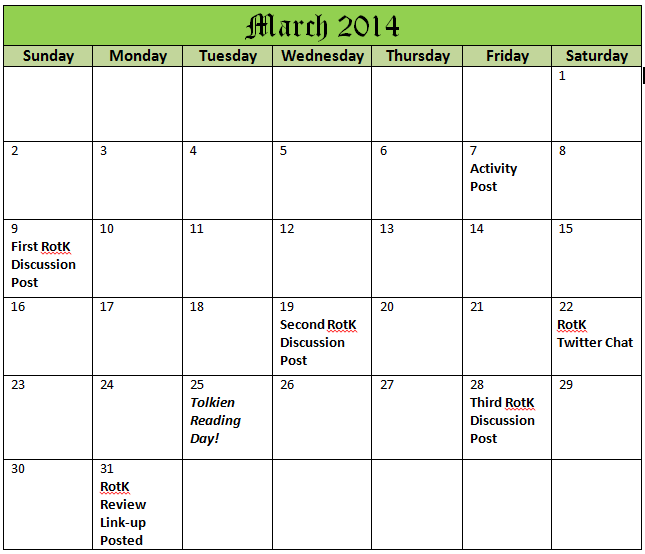 Each month featured discussion posts, a Twitter chat, and a mystery activity. Review of The Two Towers: Friday, February 28. Thursday, February 27: Book IV Chapters 6-10. In late October and early November 2013, Pages Unbound celebrated Halloween by featuring scary tales. Personality Quiz: What Type of Spooky Story Would You Belong In? On July 1-6, 2013, we hosted a Reading Robin Hood event, welcoming all posts related to Robin Hood books or films, including retellings. Personality Quiz: What Member of Robin Hood’s Band Are You? In February 2013,we held a month-long read-along of the works of C. S. Lewis with book reviews, discussion posts, and activities. Personality Quiz: What Type of Talking Animal Would You Be? If You Like C. S. Lewis, Then Read…. 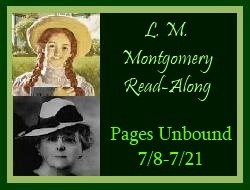 On July 8, 2012, we hosted a two-week L. M. Montgomery Read-Along featuring reviews, guest posts, a personality quiz, and more. Quiz: Which Montgomery Heroine Are You? On March, 25, 2012, we hosted a two-week long Tolkien Reading Event with reviews, guest posts, and surveys to celebrate Tolkien Reading Day. Feature: If You Like Tolkien, Then Read….